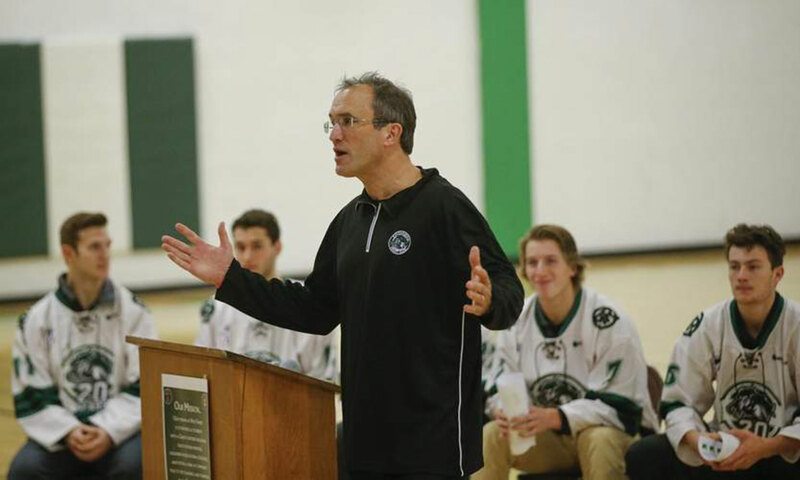 That was the message Cedar Rapids police officers and Cedar Rapids RoughRiders hockey players carried Wednesday morning at LaSalle Middle School during the rollout of a new anti-bullying program. The police department and RoughRiders have teamed up to take on bullying in local schools with a new school program called “Every Goal Matters.” The program focuses on promoting leadership and kindness, and encourages students to intervene or say something when they see a classmate being bullied. Community outreach officer Shannon Sampson said the police department worked with students from LaSalle Middle School and Prairie Point Middle School to develop the program. “We talked to them about what they were seeing in their schools and their own experiences with bullying and used that information when developing this program,” she said. During the program, Sampson discussed what bullying is and how to recognize when someone is being bullied. One in five students in the United States reports being bullied, she said, adding that 3.2 million students are bullied each year. As a result, Sampson said, 160,000 students nationwide skip school every day because they fear being bullied. More than half of bullying incidents stop when a peer intervenes, she said. As part of the program, five RoughRiders team members — Chase Hamstad, Kyle Looft, Liam Walsh, Jason Polin and Max Sasson — shared some of their own experiences with bullying and talked about taking action to help those who might be bullied or ostracized. Sasson shared a story from his elementary school days about a new student who had recently moved from Georgia. The message, he said, is that a little can go a long way. Hamstad talked about a friend who was bullied in school because he had a disability. Walsh, Looft and Polin talked about stepping up to do what’s hard. "It’s easier to ignore or avoid helping when you see someone being bullied," Walsh said. "It’s harder to intervene or say something or to include a kid who is being excluded." Doing the right thing isn’t always easy, but it’s those little things — sitting with an ostracized student, speaking up when someone is being mistreated or showing kindness to a student who is struggling — that can make a big difference in someone’s life, they said. Officer Sampson said the police department and the RoughRiders plan to continue the program, bringing it to other area schools, in the hopes that the message can bring an end to bullying in Cedar Rapids schools.